The Pursuit of Happy Hour – Happy Hours and Deals in Hampton Roads, Virginia. Every Tuesday, Cinemark Movie Theater in Newport News’ City Center and AMC Movie Theater in Hampton offer $5 standard movie tickets all day and night (3D, IMAX, and other special theaters have upcharges). Cinemark doesn’t require you to be a member to buy $5 tickets. For AMC, you’ll need to be an “AMC Stubs Insider” member; it’s free, but still an extra step. Cinemark allows you to bring food and drinks from its two neighboring restaurants (MyPi Pizza and Neo Kitchen & Bar) into the theater to enjoy during your movie, which allows for a better variety of options and pricing. Depending on your show time, you can get any specialty pizza at MyPi for just $6! If you’re in the mood for drinks, the theater lobby shares a space with Neo. You’ll always find moviegoers killing time before their showing at the bar. My favorite Neo combo is a beer flight and calamari, although it’s not the easiest thing to transport. Now, one thing that AMC does have going for it is its close proximity to Dollar Tree in the same plaza. You know what I’m getting at here, people. No matter which theater you choose, it’s a great deal given that evening movie ticket prices have reached doubled digits. So the next time you see a good movie trailer and want an affordable date night, family night, or night out with friends, plan for Tuesday! 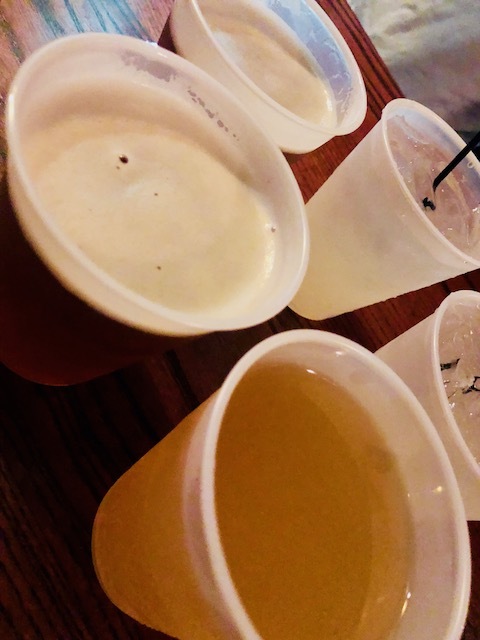 On Monday, Wednesday, and Friday, Manhattan’s Deli in Newport News offers $1 domestic drafts and $2 wells with soda from 7 to 9pm. I point out the soda because I tried to order a cranberry vodka and wasn’t able to get the deal. They did let me get vodka lemonade, though. The atmosphere on a Friday night was that of a college bar: loud, dark, crowded, and your drinks come in small plastic cups. Not the right choice if you’re looking for conversation and ambience. If you’re looking to party, you nailed it. 1) Liquid Courage for the Dance Floor: Every Friday a live DJ starts around 9pm. They had tables on the edge of the dance floor, and it didn’t take but 30 seconds after the DJ began for one of the groups at the tables to get up and start shaking it. 2) The Ultimate Pre-Game. 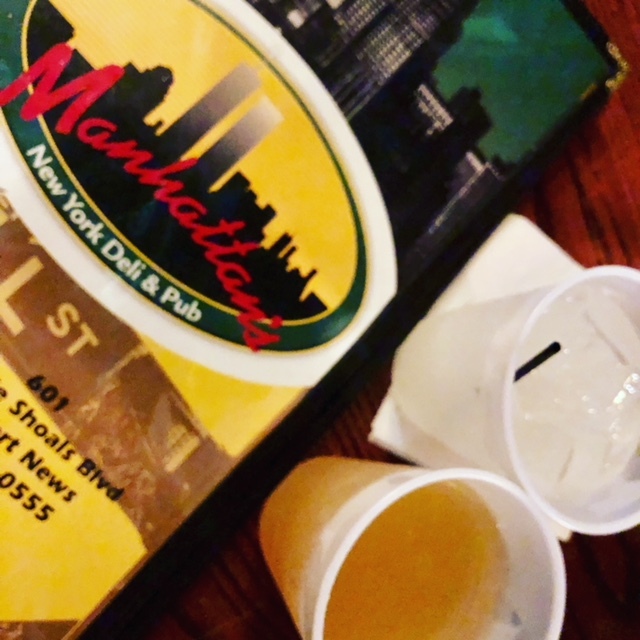 Manhattan’s is located conveniently near City Center, which has multiple other bars to hop around. Directly next door and across the street you’ll find Jose Tequilas and Tradition Brewing. Closer to the fountain, you’ve got Salsa’s for latin dancing, Hiyashi for sake lovers, and Boathouse and the Cove for live music. Manhattan’s gives you a great starting point (and small starting tab) for a DIY bar crawl. And for some of us, a few hours of $1 drinks will last us an entire night. For those of you that want to enjoy cheap drinks but not have to shout at your friends, there are a few quieter tables in the back if you’re lucky enough to grab one. They also have a small patio. I’ve personally only been to Manhattan’s happy hour on Friday, but according to their website, Monday’s are Kareoke Night. No matter which night you choose, you’re in for a great deal. You want to know one of my favorite characteristics in a happy hour? No time limit. That’s why I’m a big big fan of $5 martinis, all day and all night on Fridays at Park Lane in Hampton. The martini menu hosts a good variety, and all the martinis we tried were good. I personally will be staying loyal to the Smores-Tini: whipped cream vodka and white crème de cacao. Yum! Not only do I find it to be the tastiest, but it also unarguably wins best in show. Look at that chocolate swirl! It even has marshmallows and a graham cracker crust. If you’re a peach lover, the Bellini-Tini is also worth trying. Disclaimer: If you want to take advantage of this deal, be prepared to wait for it. My friends and I went around 7, and it was about a 40-minute wait. It took around 20 minutes before we were even able to grab seats in the waiting area. The good news is we were able to order our first round of martinis at the bar and sip them as we waited. Once seated, we ordered their Fried Brie & Fruit appetizer for the table. I love brie, but it left something to be desired. We ended up asking for a baguette and turned it into a spread. I’ll stick to mozzarella for my deep fry fix. For dinner, I got their $10 rotating “Panini of the Day”, which that day was Turkey, Cranberry, and Goat Cheese on a baguette. Who knew Thanksgiving tasted so good in the middle of Summer? It came with chips, which I opted to swap for a Caesar Salad for just $1. The meal was delicious, nicely sized, and one of the more affordable entrees on the menu, so I’ll definitely check the daily Panini again on my next visit. 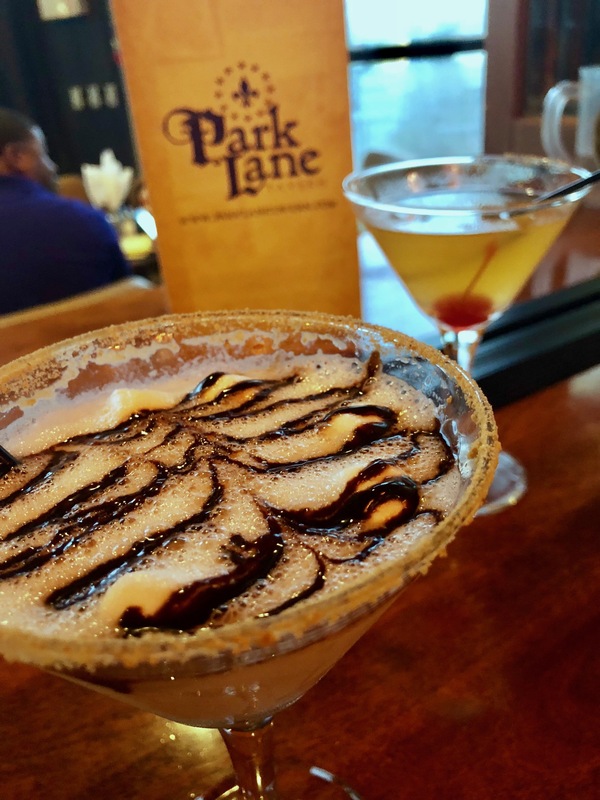 Park Lane has a happy hour special every week day, and most of them last all day. Check out my post for their half-off fish and chips on Tuesdays. You can find Park Lane’s other daily specials here. If you’re ever bored and broke on a Tuesday night (or if you just think bowling is a blast like me), AMF’s got you covered. When the clock strikes 8pm, “$2.22 Tuesday” begins. That means $2.22 bowling shoes and games! AMF’s $2.22 Tuesday also features rotating specials on food and drinks. When I went a few weeks ago, it was $2.22 pizza and PBR tall boys. The pizza was no MyPi, but pretty good for alley food! As of writing this, it’s $2.22 tacos, PBR, and long islands! You can always check out the current special on their website. The deal on alcohol end at 9pm, so I recommend getting there early. The food, games, and shoes stay on special until close. Side note: they’re not on special, but their Wild Style Fries (AKA fries smothered in multiple cheeses, bacon, and sour cream) are amazing and worth the full price. It’s even more of a steal if you have your own bowling shoes like me. (No, I’m not good at bowling, but why pay for shoe rentals when you can have your own pair for $30?) Can’t beat a $4 night out. What’s better than sushi? Sushi paired with $5 martinis! Or sushi paired with $3 wells and beer, $4 wine and sake, or $6 shots. The choice is yours during Saisaki’s Happy Hour! You can even go for a hybrid and get a “Sake Tini”. Those who elect to go for martinis have a good number of options and styles to choose from: dry, fruity, sour, creamy. In my experience, a quality you’ll get no matter which you choose is strong. I recommend trying the lychee martini. For those unfamiliar with the fruit (which comes as a garnish), it may not appear appetizing, but I promise, it’s delicious! While the sushi itself isn’t on any kind of special, you can pair your happy hour drinks with all you can eat sushi for $26. Just be careful, as the menu warns that they will charge you a la cart pricing for any sushi left uneaten. For those who haven’t quite warmed up to the idea of raw fish, there’s still plenty of food for you to soak up your happy hour with. View Saisaki’s full menu here. And really, you don’t even have to eat at all. They have a fully stocked bar tucked away from the rest of the restaurant. Who needs food when you can just sip away inside this neon glow? I’ll leave you with this photo of my adorable friend and partner-in-mass-sushi-consumption. Cheers to another great find on our pursuit of happy hour! After mourning this fact, I Googled to make sure both MyPi locations weren’t closed. Thank goodness, this wasn’t the case. So, to Newport News I drove. That is how dedicated I am to bringing you guys the best deals in the area (and how badly I didn’t want to cook dinner tonight). I opted for my personal favorite, the Hawaii Pi-O. Yes, I’m on team pineapple. You can dine in, carry out, or if you’re in the mood for a movie, you can take your pizza to the Cinemark theater next door and enjoy your pie in front of the big screen. I love to grab a pizza and a flight of beer at Neo, another restaurant that shares a space with the theater, for my movies. No matter where you choose to consume, it’s a great deal on some delicious food! Second Street Bistro extended their happy hour to start as soon as they open through 7pm, seven days a week. That’s 8 hours of happy hour every day, people! That’s not easy to find, especially on the weekend. My friend and I went to check it out on a rainy Thursday afternoon. Happy hour specials are available either at the bar or on the patio. Despite the dreary weather, we elected to sit on the covered patio and enjoy the warm air. The environment is what I enjoyed most about Second Street. Even on a rainy day, it was nice to be outside on their covered patio. String lights and lanterns hang from the ceiling, and we got the honor of sitting right next to the fireplace. Our waitress pointed at that the rain was good for the garden that’s just off the patio; they grow herbs and veggies, which they use in some of their dishes, including the olive oil they served with bread to our table. 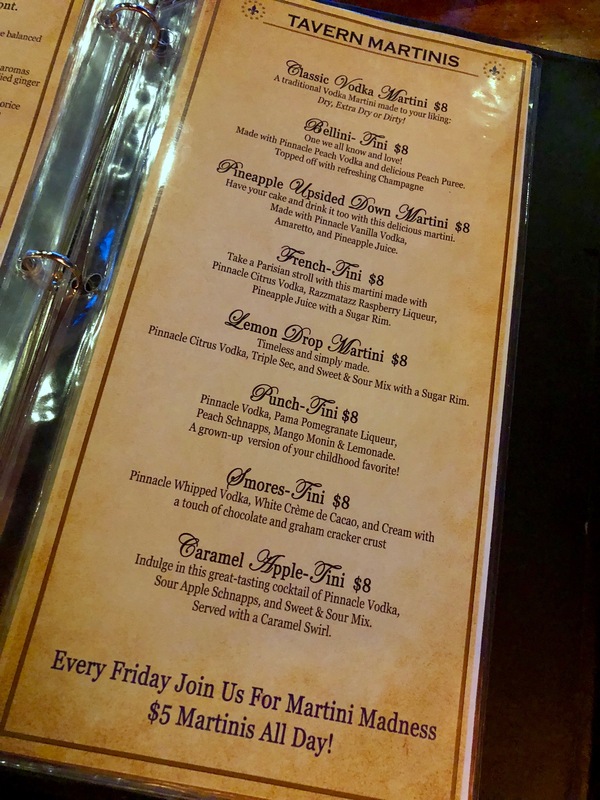 I compared Second Street’s regular menu with their happy hour menu, and it seems that how good of a deal you get on cocktails depends on your order. For example, the “Whiskey Smash” and “Brown Sugar Margarita” are $7 during happy hour. The Smash is $8 regularly, just a $1 difference. The Margarita, however, is regularly $11. Beer lovers get the best deals; Second Street has a variety of canned, draft, and bottled beers for just $2 and $3. The (delicious) sangria is also well priced at $5. As far as food goes, Second Street offers $2 off their appetizers and grilled pizzas. After the discount, the appetizers tend to range from $4 to $8 and the pizzas from $8 to $10. My company has hosted multiple events at Second Street, so I was already familiar with their food. I’m always excited for the Thai Poppin’ Shrimp and the grilled pizzas, both of which are perfectly cooked and packed with flavor. For this visit, I ordered the Brown Sugar Margarita. I personally didn’t think there was anything special about it and, since it was $7, I will stick to better marg deals elsewhere. The red sangria is a different story. It was so good that we decided to try the white sangria, too. We dubbed red the winner. Both are perfect for summertime sipping. Overall, Second Street’s prolonged happy hour and patio will keep me coming back. It’s a great place to share a pizza or two among friends and enjoy a sangria and the breeze. All day on Tuesday, European-tavern inspired Park Lane offers half off the price of its most popular dish: Fish and Chips. My British colleague Gary was in town for the week, so I decided it was a great time to try it so he could gauge its authenticity. His verdict: Park Lane is doing it right. He was especially impressed by the availability of malt vinegar. According to Gary, to really enjoy your “chips” properly, you need to cover them in the malt vinegar and then add salt. I was unprepared for the size of the fish. I ended up bringing half home with me (This is not a complaint… I’m always happy to have lunch for the next day). After the discount, the price came to $7.50, which I would say is well worth it since the portion was generous and it tasted great, too! You can check out Park Lane’s other daily specials here. P.S. If you have room for dessert, the Irish Whiskey Bread Pudding was delicious.